I live in a village known for its beaches. Holiday time is quite a nightmare where I live, and so I prefer to use my car as seldom as possible. Our house is in a road one block away from one of the main roads leading into Gordons Bay, and this road is always busy. It is OK when we leave home in the car and have to turn left as we are turning into the traffic, and there is a robot a block away from us so there will be a break in the traffic. But going straight and turning right can take an age in season. In order for me to do my grocery shopping it is easier for me to walk. The walk is pleasant and all of two blocks, and these are really short blocks. I have to cross this main road to get to the supermarket and this in and of itself is a nightmare. At the end of our block is the local primary school. In order to accommodate the children crossing this busy road there is a pedestrian crossing. This crossing is manned in the morning before school and in the afternoons after school by the local traffic authority. This is necessary as drivers could not be bothered to stop at the pedestrian crossing. In Europe as soon as you put your foot onto the crossing, the cars stop. Here, I have to wait until there is a break in the traffic to cross at the pedestrian crossing. It makes me so angry as someone one day is going to get run over due to the drivers in this country not realizing that they are meant to stop at a pedestrian crossing when they see people. I wish my legs were long enough to kick the passing cars. I do gesticulate at the drivers but it does not help. The one pre dinner / cocktail party dish you will not consider a nightmare are these blinis. Dave and I were having friends over for a whisky tasting evening and I whipped up a batch of these during the afternoon which we enjoyed that night with our whisky. Do you have the same problem with pedestrian crossings where you live? These are the ultimate cocktail party canapé and make a great one bite treat with a topping of your choice. I used peppered mackerel for half and cured salmon for the rest. People ignore zebra crossings here in Dubai, which is initially a shock as in the UK, as you say, the moment someone steps out the traffic comes to a halt. However, I read that this is going to be enforced soon – a good thing. Just hope the driver behind me realises this as I put on the brakes!! Love, love, love blinis and make mine with buckwheat flour. I am not sure I would trust the driver behind me Sally! Thankfully I live out in the boonies and have no issues with traffic or being run down. 🙂 Your blinis look marvelous. I live in NYC, I don’t think we even need to have a conversation about pedestrian crossing here Tandy LOL. I mean, if you do, let me know lol. Wonderful blinis :). Fabulous looking blinis, I bet they were delicious! 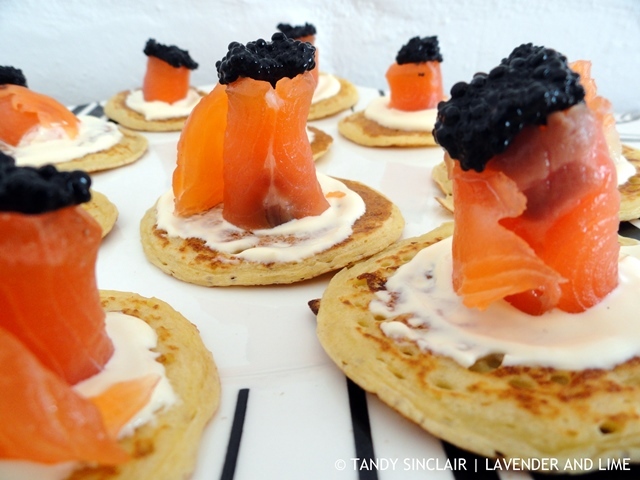 I love blinis and can’t think why I didn’t do any over Christmas….! These are such fun little bites! I’m such a sucker for smoked salmon. You’re very committed making little yeast blinis Tandy. Yes, as a dedicated pedestrian, I have been known to stop mid cross & gesture as the driver so they know that pedestrians have right of way. Some fist shaking may be involved! Your blinis look like delicious little morsels that I want to gobble down, Tandy! Your home sounds delightful, but, like everywhere, there are fools on the roads! Take care my friend. Well doesn’t this look lovely and delicious!! Im sure your guests will love these!! I LOVE salmon!! 🙂 YUM! Sounds like a magical place, except for the traffic. Love these blinis! Oh, one of my favourites – Tandy – pedestrian crossings can be hit and miss here – cars are supposed to stop if you are on the crossing but it is always wise to be cautious! Hi Tandy! Happy New year 🙂 These blinis look delicious, thanks for sharing! As for the pedestrian crossings here in Madrid, they’re just fine, but being such a touristic city, there are many crossings controlled with lights. These look so perfect to enjoy along with a glass of whisky 🙂 Beautiful! I live in Boston and let’s just say drivers are a little bit crazy. BUT so are pedestrians and it also makes me nuts when they think they can cross the street at any time they please and cars should just stop for them! 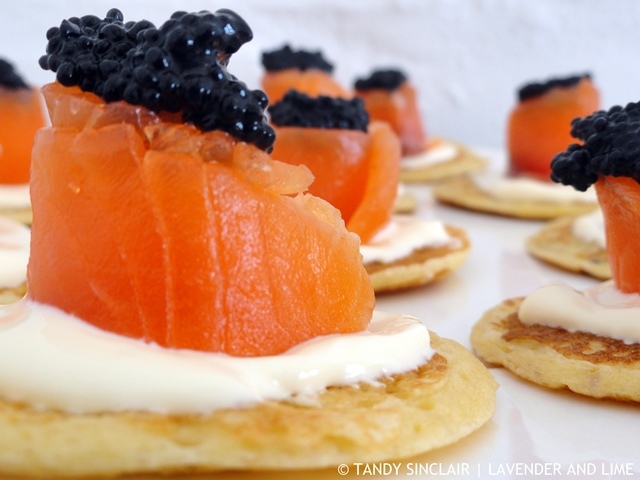 Your blinis look divine Tandy. It’s crazy how some countries a pedestrian crossing just doesn’t matter. We almost got run over in London because we thought that cars had to stop! Love the look of these blinis Tandy! Loving those close up shots of your little blinis appetizers. They look so good and I am sure much easier to eat then it is is to gather your groceries. I am very familiar with the nightmare of traffic in Hong Kong and even pedestrian traffic. A nice walk to to gather supplies is much better than all the hassle of driving. The only plus of driving is we would not have to wrestle with our bags and granny bags on the way home. Sharing!! !